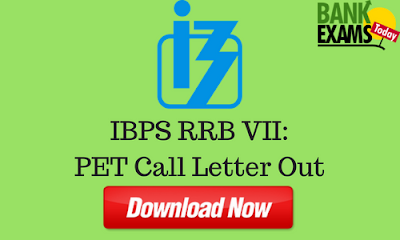 Institute of Banking Personnel Selection (IBPS) has recently released the Pre-Examination Training Call Letter for RRB VII 2018 Recruitment. You can download your Pre-Examination Training Call Letter from here. Commencement of Call letter Download:- 18 - 07 - 2018. Closure of Call letter Download:- 04- 08 - 2018(For Officers (Scale-I)) & 11- 08 - 2018(For Office Assistant (Multipurpose)). Click Here to Download your PET Call Letter(Officers (Scale-I)). Click Here to Download your PET Call Letter(Office Assistant (Multipurpose)).